For some, the party starts when the beat drops. But this time, the party starts and goes on and on with a Parade of Bass. No interruptions. No shortage. The unfaltering and contagious beat goes round and round courtesy of DJ extraordinaire Dillon Francis. 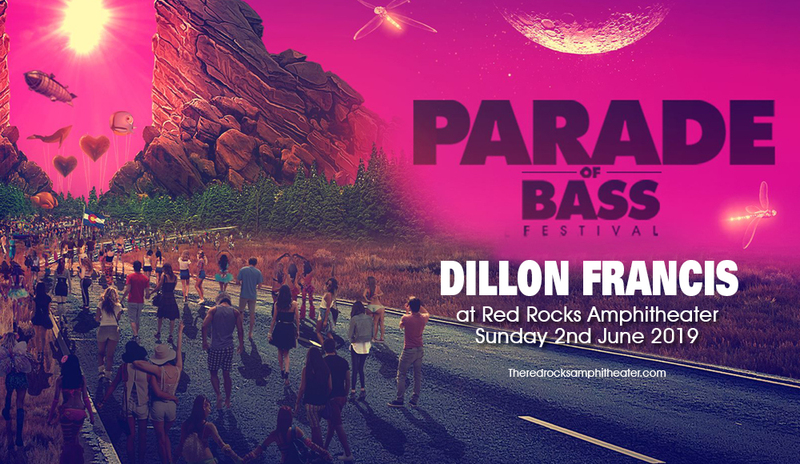 Party people will come marching in at the Red Rocks Amphitheater on Sunday 2nd June 2019 to move and groove to the Parade of bass: Dillon Francis. And definitely, there will be a parade-like demand for tickets to this show. Don't be left behind! Book your tickets now! From internet celebrity, Dillon Francis' electro house mixes and DJ skills positioned him at the top of his game, leading him to perform at major venues and clubs around the world. His unique moombahcore sound has given him that competitive edge and made him stand out from the pack of DJs and EDM artists. The release of Dillon Francis' first EP in 2010 called “Swashbuckler” started the ball rolling. It caught the attention of American DJ, Diplo, who later signed Francis to his label Mad Decent. A collaboration between the two ensued, with Francis working with Diplo on the track “Que Que” –a catch dance ditty pumped-up with bass lines and infused with samples of Spanish dance rhythms and vocals. Francis meteoric rise in popularity was triggered by the release of the moombahton track “Masta Blasta”. The track “IDGAFOS”, which features samples of Adam Levine’s vocals on the Gym Class Heroes’ song “Stereo Hearts,” drove Francis further into the chart action. The single topped the blog Hype Machine charts and was also used in a highly televised advertisement for the 2014 Super Bowl. Not only the fans took notice. Citations and recognitions poured in as e also was listed on MTV Clubland’s Artists to watch in 2013, and also labeled as the No. 73 DJ in the DJ Mag Top 100 poll. In 2014 he released the hit single “Get Low” with DJ Snake. It became a dance floor sensation in European night clubs and sizzled at the top of the charts in Australia, Austria, Belgium, Canada, Germany, Scotland, France, the UK, and the US. It also went platinum in the US, and gold in Australia and Canada, making it his biggest mainstream single to date. The Parade of bass featuring Dillon Francis is coming this way. Step-right up and join the parade!